Not everyone suffers from chronic pain in Michigan, but many people do. 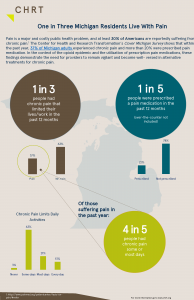 Our Cover Michigan Survey found that more than 35 percent of the state’s residents say they experienced chronic pain which limits their lives or work within the last year. 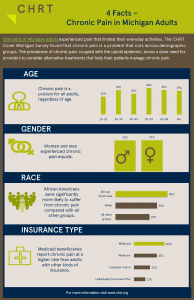 These infographics from the Center for Health and Research Transformation are based on consumer response, and show how many people report suffering from chronic pain, along with who is most affected. Click the images at right to view the PDFs.